Identification Pretty white five-petalled bell-shaped flower (10 – 15 mm) is held solitarily on a stem which comes directly from the roots. Petals are lined with a trace of pink veins through to the golden centre of the flower. Leaves are trifoliate, each leaflet heart-shaped and these fold up towards late afternoon or in rain as do the fragile flowers. This native Irish plant is found carpeting old, undisturbed woodlands in spring. This pretty downy perennial also grows on moss-covered trees and shady walls and is widespread throughout the country. Also known as wood sour, leaves can be used in salads and soups. 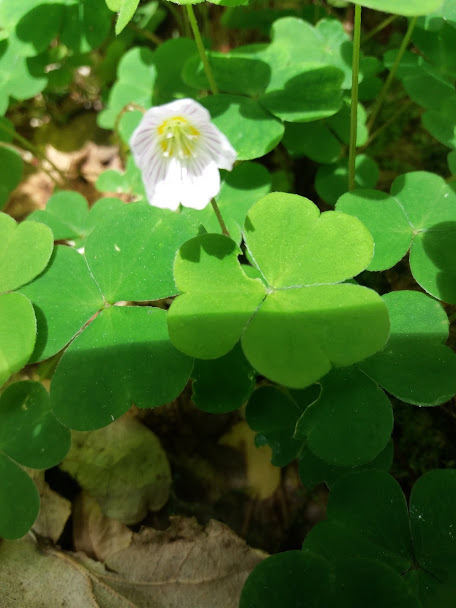 Wood Sorrel was known to cure mouth ulcers and whooping cough. Please note large doses may cause oxalate poisoning. It was also used to remove iron from linen. It was thought to be the original Shamrock that St. Patrick picked.